Fingernails come in handy when you have an itch to scratch. But you may not know very much about them. This tough and hardy tissue protects your fingers and toes. Nails help you grip and manipulate small objects. Imagine peeling an orange or unwrapping a gift without them. But what makes for healthy fingernails? Nails are very useful, but a bit mysterious. These curious clutches can give you valuable information about your health and nutritional status. Signs from your fingernails can alert you to nutrient deficiency and tell you when your diet is top notch. Healthy fingernails reflect a healthy body. Look closely at your claws to see what your body is telling you. Solving the mystery starts with anatomy. Your fingernails have been growing since before you were born. And they’ll be with you throughout your entire life. But fingernails are more than meets the eye. They are a complex hybrid of the cells and protein that constitute skin and hair. Learning the following terms will help you understand how your fingernails are structured. Stratum corneum: The outermost layer of your epidermis (skin). The stratum corneum is full of the protein keratin, which gives fingernails their firm texture. Nail plate: Your fingernail. The nail plate is made of keratin that hardens and gives your fingernails structure and rigidity. The underside of the nail plate is full of ridges. These adhere to the nail bed below. Nail bed: The area upon which the fingernail grows. The nail bed is vascular and has grooves that complement the ridges underneath the nail plate. This allows the nail bed and nail plate to stick together. Lunula: The half-moon shaped, white arc at the base of your fingernail. The lunula is white due to the high concentration of nuclei in the nail matrix underneath. Nail matrix: The nail matrix lies below the lunula and is the source of keratinization—the process where the proteins in fingernails are assembled in the nail matrix. Cuticle: The cuticle is a layer of skin that grows over the base of the nail plate. This protects the nail plate from damage or infection. Nail development begins during the ninth week of pregnancy. By week 16, fingernails are visible on a growing fetus. From birth and beyond, nails grow between three and four millimeters every month. This continuous growth can be attributed to the cells that make up the nail. Fingernails are primarily comprised of the protein keratin. This structural protein is produced in large quantities by skin cells, and is also found in your hair. Since the rate of skin-cell turnover is high compared to other cells in the body, the supply of keratin is always being replenished. The keratin in your nails originates in the stratum corneum and is assembled at the nail matrix. Your nails grow from the nail matrix at the base of the nail bed to the ends of your fingertips. The nail plate covers the nail bed and protects the delicate skin and blood vessels underneath. The nail plate stays tightly bound to the nail bed through matching ridges and grooves that fit snuggly together. Cuticle tissue seals the gap between skin and nail and prevents germs and microbes from infecting the skin. Each piece of your fingernail performs an important function. It is necessary to keep your nails in good condition so they can best serve you. Think of your fingernails as a dynamic timeline. From the fingertips to the base of the nail bed, your fingernails store valuable information about your health and diet. This information updates as your nails grow—so be on the lookout for changes. Healthy fingernails are tough and strong. But when nutrition is lacking or another concern is present, this isn’t always the case. Be aware that changes in your fingernails could be signaling a change in your overall health. Weak nails are brittle and split or crack easily. This can be a symptom of dehydration. Since nails and skin are similar in their cellular makeup, their care is, too. When dryness is an issue, moisturizing is an excellent remedy. Applying lotion to the skin and nails after a shower or bath is a great way to lock in moisture beneath the surface. In addition to moisturizing, steer clear of things that dry out your nails. The acetone in fingernail polish remover is an often-overlooked culprit. To reduce any damage done to your nails by removers, limit yourself to changing your nail polish twice a month. Avoid exposing your fingernails to household cleaners and detergents. The chemicals in these products dry skin and nails out quickly. Shielding your hands with a pair of rubber gloves could be the solution to dry and brittle nails. You can maintain strong fingernails by getting B-vitamins in your diet. Biotin (a B-vitamin) has been linked to maintaining nail strength when taken as a dietary supplement. Taking biotin can have similar effects on your hair and skin, as well. There is preliminary evidence to suggest that biotin supplementation supports the thickness of hair and maintains a healthy-looking complexion. A nutrient-rich diet can promote the color and shape of healthy fingernails. Eating foods rich in iron—like green veggies, lean red meat, and peanut butter—can supply your body with the iron it needs for smooth operation and beautiful nails. When diet alone is not enough to supply iron needs, supplementation may be necessary. Zinc is another important nutrient to maintaining healthy nails. This mineral can be obtained through a diet that includes beef and seafood, as well as zinc-fortified cereal. This important mineral is also a common component of multivitamins and immune-support supplements. Keep your hands clean: Washing your hands often has the added bonus of maintaining nail health. Keeping your fingernails clean and dry helps protect your nails against potential pathogens. Follow a hand wash with a good moisturizer. Rubbing lotion into your nails and nail beds can strengthen them and keep them from splitting. Stop biting your nails: Using your teeth to cut your nails invites germs to set up shop in or around your fingernails and mouth. 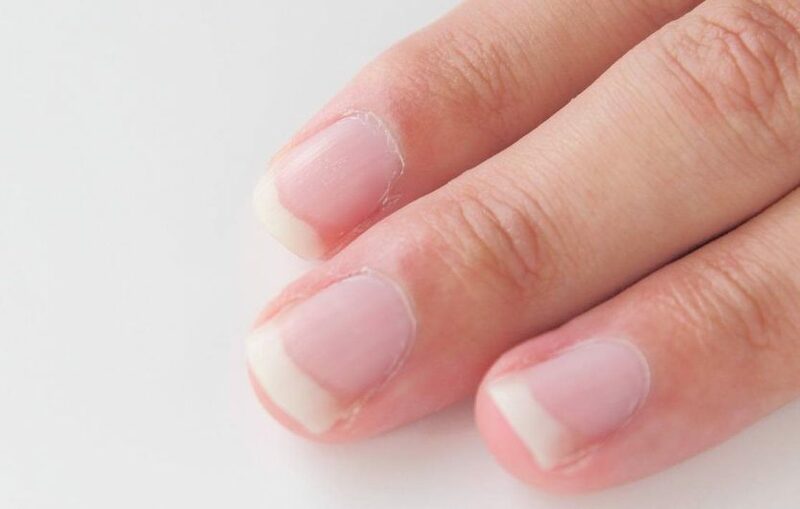 Nail biting can also hinder your nail’s ability to grow evenly and may lead to deformities. Yoga and meditation are two great ways to relax and may help reduce the urge to chew your nails. If you need more immediate relief from nail biting, try applying bitter-tasting nail polish or lemon juice to your fingertips. The unpleasant taste could help you (or your kids) break the habit. Cut your nails correctly: When you clip your nails safely and correctly, you can avoid painful ingrown nails and hang nails. Start by trimming long nails straight across. Then file the edges so they are slightly rounded. When nails snag or break, try to trim them quickly to avoid any additional injury. Get professional nail care: A manicure or pedicure session can be relaxing. Just be sure that the tools used are properly maintained and sterilized. This minimizes the spread of germs. If you are unsure of your favorite salon’s equipment handling, ask if you can provide your own. Remember to never remove your cuticles. 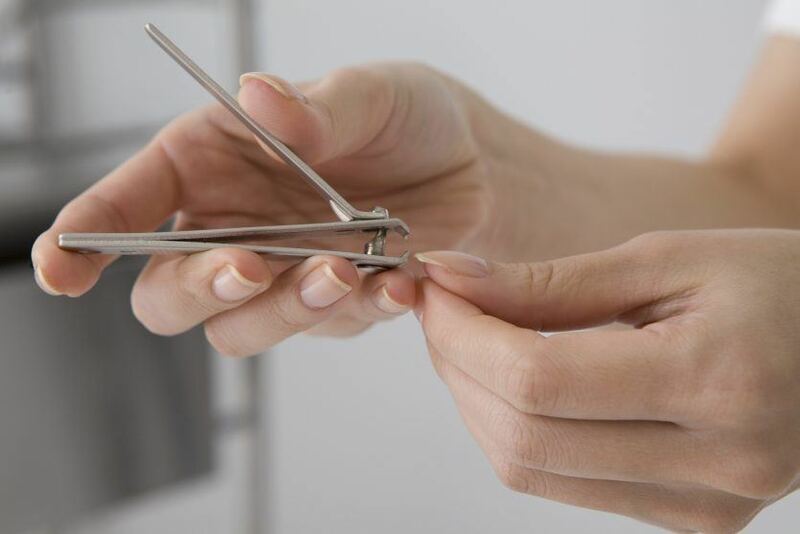 Cutting your cuticles removes important protection for your nails. If you polish your nails frequently, opt for non-acetone-based nail polish removers. Acetone can weaken and dry out nails over time. Prep your body with quality nutrition: Fuel your body with the nutrients it needs to maintain healthy fingernails. Check your diet for adequate amounts of iron, zinc, and biotin. Supplement your diet with vitamins, minerals, and nutritionals that promote healthy, beautiful nails.